Wenham – Robert Peter Johnson 70, died Friday, October 26, 2018 at the Beverly Hospital. Born in Beverly, he was the son of Helen S. (Koslouski) Johnson and the late Theodore R. Johnson Sr. He was raised in Wenham and graduated from the Hamilton-Wenham High School, class of 1967. 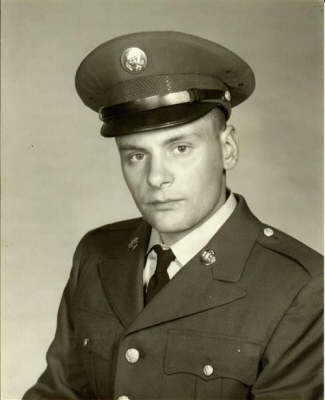 An honorably discharged veteran, he served his country during the Vietnam Era as a member of the United States Army and was a member of the V.F. W.
Mr. Johnson had been employed by the Town of Essex until the time of his retirement. Prior to that he had worked for the Seabrook New Hampshire Elementary School. A lifelong resident of Wenham, Peter was an antique car enthusiast and enjoyed working on his 1932 Ford Roadster as well as other vehicles. In addition to his mother, he is survived by his brother, Theodore R. Johnson Jr. and his wife, Judith of Wenham, a niece, Katie Johnson of Beverly, a nephew, Adam Johnson and his wife, Marissa of Savannah, GA and numerous cousins. He was also the brother of the late Thomas H. Johnson. His funeral service will be held graveside, at the Iron Rail Cemetery, Rubbly Road, Wenham, Thursday, November 1, 2018 at 10 a.m. Relatives and friends are invited to attend. Visiting hours at the Campbell Funeral Home, 525 Cabot Street, Beverly, Wednesday from 5 to 7 p.m. Contributions may be made in his memory to the charity of one’s choice. Information, directions, condolences at www.campbellfuneral.com. To send flowers or a remembrance gift to the family of Robert Peter Johnson, please visit our Tribute Store. "Email Address" would like to share the life celebration of Robert Peter Johnson. Click on the "link" to go to share a favorite memory or leave a condolence message for the family.